We are excited to present our inaugural Blueprints post, “Making a Twitter Bot in Python: Iterative Code Examples” by Robin Camille Davis & Mark Eaton. Our Blueprints section aims to showcase (innovative) recipes or (innovative) applications of a standard recipe for digital teaching and research that can be shared among instructors and researchers. We hope you find this tutorial informative and inspiring, and encourage you to submit a Blueprint of your own! Twitter bots are everywhere on Twitter, making us laugh, annoying us, and occasionally spitting out profound truths. These bots are made by artists and activists, scholars and spammers. And as it turns out, building a Twitter bot is a fun and productive way to introduce yourself to basic programming in Python. We have provided five sample scripts that work with pretty minimal set-up, along with instructions and suggestions for customizing the scripts. This tutorial is based on the LACUNY Emerging Technologies Committee’s “Build Your Own Twitter Bot” day in December 2015, which was billed as a gentle introduction to programming in Python. Below, we will expand on some of our insights and examples from this workshop. If you are creating a bot, it is a good idea — although not strictly necessary — to create a Twitter account dedicated exclusively to your bot. You could run your bot on an existing account, such as your personal Twitter login, although this will depend on what your bot is doing. You probably do not want your followers to see the test tweets you will send out. 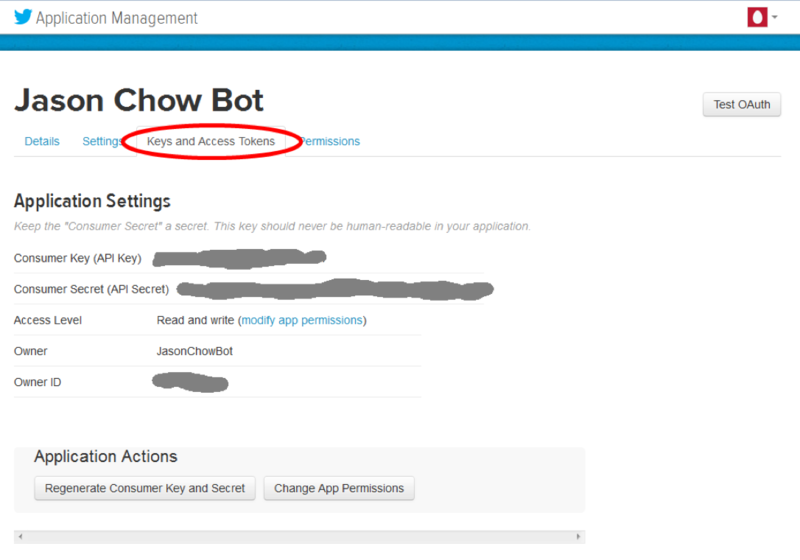 It is also necessary to generate an Access Token and Access Token Secret by clicking on “Generate My Access Token and Token Secret.” Keep track of these keys and tokens; you will need them for your bot. After obtaining your Keys and Tokens, download the bot scripts from GitHub. These will work almost immediately, after minimal setup. The setup may be a bit more complicated if you are using a Windows machine; there are some suggestions for Windows users below. Paste the Keys and Tokens into the credentials.py file, in the spots indicated with the placeholders XXXXXXX (see code below). These credentials are used by each of the sample bots when they communicate with the Twitter API. The code above is presented for illustration only. Use the scripts you downloaded and edit them on your computer. To get started, you will need IDLE, a development environment for Python; and Pip, the Python Package Manager (which we will use to install a couple of code libraries). For most Linux and Mac users, these items may already be in place. Open the command line, also called ‘Terminal’ on a Mac computer. This should appear as a blank window with your username, computer name and a cursor. If you are using Windows and you do not have a command line interface on your machine, you can get one by installing cygwin or git bash. You may also have to modify your PATH variable. These steps are beyond the scope of this tutorial. Alternately, some Python functionality is available at the DOS prompt, as described here. Pip is needed to install some of the packages that are used in the subsequent scripts. Pip should already be installed if you have Python 2.7.9+ or Python 3.4+. Tweepy lets you use the Twitter API through Python. It depends on the setuptools library to work properly. If you receive an error about permissions when installing these libraries, put sudo in front of pip (e.g., sudo pip install tweepy). This will work if you have administrator privileges on your machine; sudo bypasses permissions checks, so use it carefully. Now you are ready to begin building bots! Each bot below demonstrates different functionality of Python and of the Twitter API. They are all working bots. We have presented them in order of complexity, from the simplest to the most complicated. You can run these bots as they are, or modify them to your liking! Select Run > Run Module from the menu bar to run the bot. The other Python scripts that follow can be opened and run in the same way. Modifying the strings will alter what the bot tweets. The list of strings could, of course, be expanded, modified, or shortened. However, running this script repeatedly without changing it will present error messages, because the Twitter API will not allow re-posting of identical tweets. Try changing the strings to tweet whatever you like! If you receive confusing error messages that we do not mention here, copy and paste them into a Google search box. The chances are high that someone has explained the problem on Stack Overflow or in a similar forum. ‘twain.txt’ is the text file, and ‘r’ specifies that this file is being read. This example helpfully shows how Python can utilize data from outside sources, in this case a text file. This bot could be easily modified by choosing another text file, for example a book or poem from Project Gutenberg or some other source. Pre-processing the text by removing double line-breaks and header information is necessary for best results. The indented lines that follow are executed with each iteration of the loop. Indentation and whitespace are very important in Python; this for loop will only work as expected by maintaining this indentation. tweettext is the variable containing the text. The text is stored as a list of sentences, similar to the first bot. [0:5] means that the looping will begin at the beginning of the text, and end at the fifth line. In Python this is called a “slice.” You can read up on slicing here (the bit on slicing is about halfway down). The third bot, mashup_madlib.py, produces a madlib of a William Carlos Williams poem, drawing randomly from lists of words by topic from JSON corpora compiled by Darius Kazemi, a prolific bot-maker. This bot also draws upon other interesting aspects of Python, such as random number generation, while loops, and inserting variables into strings of text. If you pick a list from Kazemi’s JSON corpora, you will need to use the raw JSON for that corpus. To find the raw JSON, click the “Raw” button on the Github page for that corpus. Use the URL for the raw page. This URL will begin with http://raw… Your bot script will be able to read this data. You may encounter problems when the JSON list you want to use is deeply nested, like in this list. Although we will not dive into the json library in this tutorial, it is worth exploring further if you want to learn more about nested lists. While all of the previous bots use Tweepy’s update_status method to post tweets, respondingbot.py uses the user_timeline method to bring some different functionality to our use of the Twitter API. Respondingbot.py bot will listen to a particular Twitter account, and when it detects activity, it will immediately tweet a random line of text, again from Mark Twain. To understand the various methods available in the Tweepy library, look at the Tweepy documentation pages. Documentation is a helpful, although sometimes frustrating, way to discover the many things that a library can do for our code. Often, documentation is most helpful when looked at alongside working examples of the code in use. Currently, the variable, line, is set to be a random line from a text file, by default twain.txt (defined in line 27). You can choose a different text file. @[participant] You’re even better than a unicorn, because you’re real. Lastly, markovmaker.py makes use of Markov chains to generate semi-intelligible text from a source text, like a book from Project Gutenberg. The script selects bits of text and links them to other bits using a common word. For instance, the source text My dog has a tail. Our neighbor has a PhD. might generate My dog has a PhD., linking the phrases on the common word has. Generating text with Markov chains often results in gibberish, and it can sometimes be funny or profound. Now your bot is tweeting Twain-flavored gibberish. Try it with another plain-text file from Project Gutenberg. Or, for an Uncanny Valley experience, use a plain-text file of your own writing. So you have gotten the hang of using the Twitter API to run bots… What next? You could now write another bot from scratch. Does your institution or pet project have data that could be turned into an engaging series of tweets? Is there a problem you could solve with bots, like online harassment? Do you have a research interest that needs more public attention? Go forth and bot! We used these scripts to introduce a room full of librarians to programming in Python. The librarians attending, most of whom had programmed previously in other languages, got a chance to immerse themselves in some sample Python scripts. The goal was to get all attendees up and running with bots within half an hour. In our experience, many code workshops get off to a rough start when attendees are unable to get the right dependencies and packages installed on their laptops. We held our workshop in a lab, and we pre-installed all the necessary libraries and IDLE on the desktop computers. As a result, very little setup time was needed during the workshop, and participants were able to progress quickly because their coding environment was stable and consistent. The only downside is that participants had to transfer their scripts off the lab computers if they wanted to keep working on their bots. During the workshop, as we progressed through each bot, we worked on our code individually and in small ad hoc groups. Impromptu modifications of the code did not always work as expected, so we helped each other debug code and showed off interesting customizations. As workshop leaders, we did not explain every part of the code, since part of the fun of learning programming is breaking and fixing code yourself to see what each part does. Progressing through these examples worked well for the audience of tech-savvy librarians who attended our workshop. As an added bonus, some of the nonsense that their bots generated was amusing or surprising. Some participants later said they wanted to keep their bot running as an ongoing project, which was wonderful to hear, since the goal of the workshop was to have everyone making and deploying bots. Overall, our workshop was an entertaining and productive way to introduce Python. Robin Camille Davis is the Emerging Technologies & Distance Services Librarian at John Jay College of Criminal Justice (CUNY), where she leads digital projects and pursues the future of libraries. Mark Eaton is a Reader Services Librarian and Assistant Professor at Kingsborough Community College (CUNY). He is responsible for social media at the Kingsborough Library, and works broadly on technology projects that support his colleagues and students. Python has a CSV module that you can import and perform read and write operations on your CSV file. Bit lame that 100% of Python Twitter Bots on first 27 pages of Google Search (NCR) use Markov. Its just looking at bunch of nearly identical bots. Zero creativity.